The Arctic represents the northermost area of the World, the Arctic Ocean and the land areas that surrounds it. The region is characterized but cold temperatures, and ice and snow. The summers are short, but with long periods of daylight (midnight sun). The winters are long and cold and with periods with no sun (polar night). 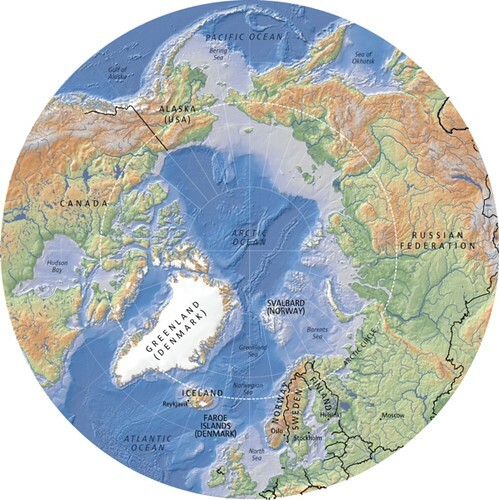 The Arctic Ocean is one basin that is mostly covered by sea ice, and is connected to the Pacific and Atlantic Oceans. The countries in this region are Russia, Finland, Sweden, Norway, Iceland, Greenland (Denmark), Canada and Alaska (USA).